Biker Claims Dallas Sheriff Made Up A Charge To Seize Video Evidence! The police are usually on high patrol during Memorial Day Weekend to look out for drunk drivers. As a result, many of us know to keep our cool on the roads so we will not get caught by the police. However, it appears that the police in Dallas were picking on the wrong group when they decided to pull over motorcycle rider Chris Moore. The arrest was part of crackdown against sport bike riders. Moore says Westbrook made up a charge in order to gain access to the video camera mounted on his helmet. However, it is pretty tough to say whether this biker was caught in the hands of a dirty police man or just getting hit hard with the law! To see what you think of the situation click below! comment to let us know your thoughts! 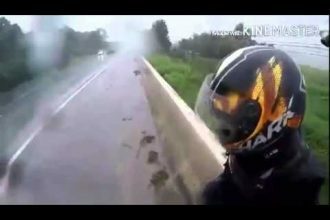 Kawasaki NINJA Use MotoGP Style Engine Warm-Up And Gets BURNED!